Eh, it’s not so much the royalties that annoy me. It’s the life+70 years that’s way out of proportion. Copyright exists to support the creator, not so much to make him (or unscrupulous big media cartels) feelthy reech until foreverity. Creators cannot create when dead, so the +70 years is well beyond the pale. (Need monies for the kids? Save up, just like everyone else.) But already the entitlement of do a thing once, reap for life, puts me off. It’s supposed to be a boon, dammit. In fact, originally copyright lasted 14 years, or twice that if you asked for it. Put it back to that and I won’t complain. You seem to be talking about a completely different situation from the one described in this comic. 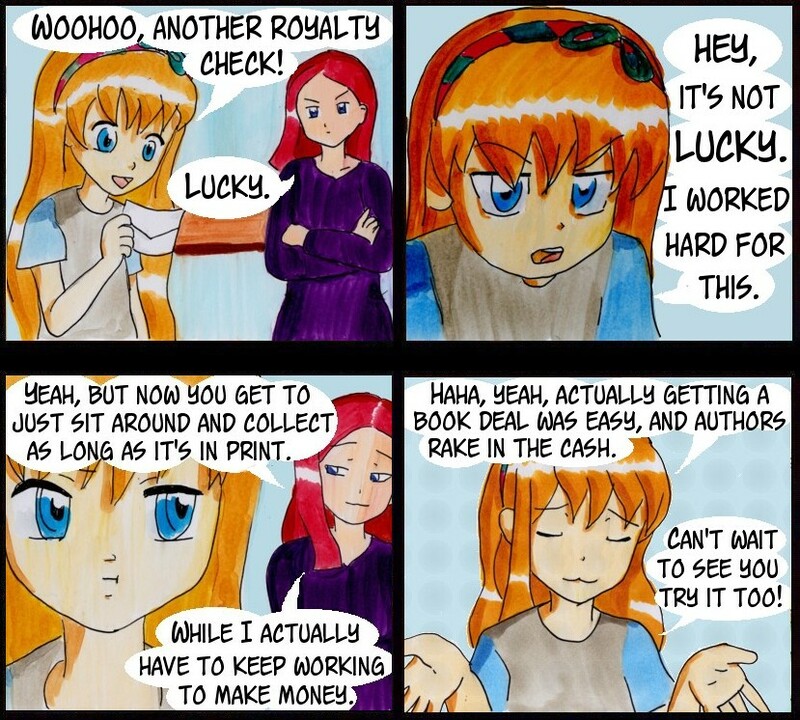 Considering how few dedicated writers make enough money in royalties to live on, I think begrudging us for continuing to get paid for something we spent many years working on without being paid is kind of awful. Exploitation of licenses is one thing. Getting rewarded (sometimes handsomely) for doing a very good job making a huge difference is a different thing. “Save up, just like everyone else” sounds suspiciously like you don’t think artists should be paid for their product even if it continues to be enjoyed and continues to cost money to make more copies of it. “Save up” is about royalties continuing past death “for the estate”, whoever that is, and you appear to’ve misread it. Which I suppose comes down to me not telling it right. The thing is that copyright is intended to support the creator. At least, that used to be the case at inception. I don’t think artists shouldn’t get paid at all, but I do think the current situation has been well and truly pulled toward the other extreme. That is, at least from the “audience” point of view, who shouldn’t be entirely spurned because that’s ultimately where the money comes from. This is where a lot of the ill-will against royalties comes from. Worse, most of the moneygrubbing is actually done by “copyright holders” that aren’t creators themselves. There are many examples and while the general public probably isn’t privy to the details (though plenty is findable) it’s clear to the paying audience that there’s greedy bastards having a jolly good time of it. For example in music and movies. You’re on the other side of that middle man so you may well see it differently, but the moneygrubbing reflects badly on the creators (writers, artists, what have you) themselves, too. In fact, it does no good to counter with “oh but that’s music, I write!” since it’s the same mechanism. Unfair, sure, but true. So, while it seems far from your situation, it’s actually something that needs to be fixed to clear up the situation, so as to have a clear story to tell to your audience. Because copyright is a law-based replacement for the support once provided by rich patrons of the art. That’s where the “boon” comes from. You’re not paid for a performance, you continue to get paid for having performed once. This is far longer than the usual worker gets, so you do have to have a good story why this is so. Yes, creating is lots of hard work, but it is something that only can happen when the economy otherwise runs at well better than subsistence, otherwise it’s “shut up and go till the fields already, peasant”. There’s value in it, but its funding source is “disposable income”, ie we could do well without if we had to. As such, taking copyright as a law-hard right –as big entertainment is doing– is already abuse in itself, only sustainable through intensive lobbying. Which is exactly what big entertainment is very very good at. But at the price of sympathy for every creator. Not your fault, but you do get your share of the fall-out. As I read it, your original complaint comes from that: “Why won’t you understand that royalties are important to me?” Sure they are important, but they’re not an automatic licence to get feelthy reech. That’s not why they were brought into being. The fact that you’re not getting feelthy reech yet do get flak for receiving what you do receive should tell you that there’s a dichotomy in perceptions. That’s what the comment was about. If you want to get your royalties and not get ribbed for it, everyone (at least your paying audience) has to not merely understand what the deal is, but also agree that it’s a fair deal. Right now that is far from clear. Because of that, merely insisting “hard work” and “yes, fair, says I”, and “why are you so mean?” is simply not good enough. Sorry. With that, above comment boils down to “your story need editing”, altough the real editing should be on the copyright situation, which would clear up much of the ill-will and ribbing.